Shoots appear to be immature trees, but at this stage of growth, the exact species cannot be identified. This plant may only be found on land in few places, mainly in the Perplexing Pool, but is also found in clusters on various cave sublevels. They do not affect gameplay, as they are just for scenery. 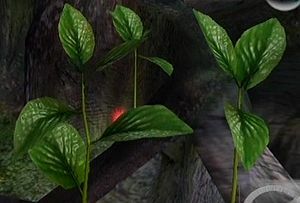 Rivaled by the Foxtail, they are quite possibly the tallest plant which can be interacted with in Pikmin 2. They also appear in Pikmin 3 , with the same appearance or in a brown version. There are two types of shoot in this game: the first type can be interacted with, while the second is used for the Arachnode's web. While there is no visible difference between the two types, the one used by the Arachnode can't be interacted with (in that they're solid). Moreover, these types of shoot disappear the day after the Arachnode has been defeated, and reappear alongside the enemy. A shoot in Tropical Wilds. Brown version of the shoot in Twilight River. This page was last edited on April 3, 2019, at 16:41.